A pro-Russian activist regulates road traffic at a checkpoint outside the eastern Ukrainian city of Druzhkovka, June 2, 2014. MOSCOW — With Russia pulling most of its roughly 40,000 troops away from its border with Ukraine, NATO and Russia have started sparring over the nation’s new cross-border tactic. As armed units from Russia mount daily attacks on Ukrainian border posts, Russia warned the Western military alliance Monday not to shift forces East. Russia's Representative to NATO, Alexander Grushko, told Interfax news agency if the Kremlin sees "a shifting of NATO's military potential towards the 'eastern wing," Russia will take measures necessary so its security is not affected. Grushko spoke as Russia and NATO prepared to meet on Monday for the first time in three months. Ukraine is not a member of NATO. Cross border attacks from Russia are expected to dominate debate Tuesday and Wednesday in a NATO defense chiefs meeting. Thursday, Russia’s support for Ukrainian separatists is expected to overshadow ceremonies marking the 70th anniversary of the D-Day invasion. That event is to be attended by President Obama, Russian President Vladimir Putin and Ukrainian President elect, Petro Poroshenko, among other heads of state. In the latest cross border attack, Ukrainian border forces in Luhansk said they battled an assault Monday by 500 armed men coming from Russia. 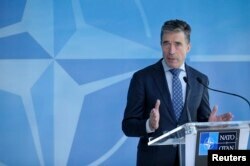 FILE - NATO Secretary-General Anders Fogh Rasmussen holds a news conference at the Alliance's headquarters in Brussels, Apr. 16, 2014. “Russia’s illegal aggression against Ukraine is a game changer. What does not change is NATO’s core task to defend our allies against attack. And make no mistake, NATO will defend every part of the alliance. No ally stands alone,” he said. During the past two weeks the Kremlin has moved most of its 40,000 troops away from Ukraine’s border. Instead of sending Russian Army units into Ukraine, the Kremlin appears to be sending arms and military “volunteers” across its highly porous land border with Ukraine. Russia denies sending any military aid across the border. Meanwhile, Russian state television has reshaped Russian opinion to see Ukrainians as enemies of Russia. In a nationwide poll conducted last month, Levada Poll found that 56 percent of respondent opposed sending the Russian Army into Ukraine. But a nearly equal percentage, 58 percent, supported Russia sending arms and military advisors to southeastern Ukraine. On Saturday, Eduard Limonov, a nationalist opposition leader unexpectedly found that he was given a downtown Moscow demonstration permit and a megaphone. Nearby, Ramil Gizatullin, a dentist, stood with a large banner calling for Russia’s recognition of the self-styled republic of Novorossiya, an entity that would combined Ukraine’s two breakaway regions, Donetsk and Luhansk. He said he wanted a tougher Kremlin policy toward Kyiv -- cutting off the gas, and recognition of Novorossiya. Hudson Institute security expert Richard Weitz says Russia’s verbal and military aggression is having an impact in the West. “One consequence of Ukraine is that it looks like it could create NATO cohesion," he said. Putin may have decided to pull back from an overt military attack on Ukraine for fear of having to pay a heavy economic price. The limited Western sanctions appear to be pushing Russia into a recession this year. Stock market and ruble exchange rate volatility are scaring off foreign investment. During the first four months of this year, $55 billion flowed out of Russia, almost equal to the entire amount for all of last year, and international bond markets have largely closed to Russian companies and banks. Since Russia’s annexation of Ukraine, no Russian company has been able to sell a foreign currency bond.